Can we hide calculation field on form, but use it with reports? Can you hide the calculation field so that the user doesn't see it, but the calculations are preserved for reporting? 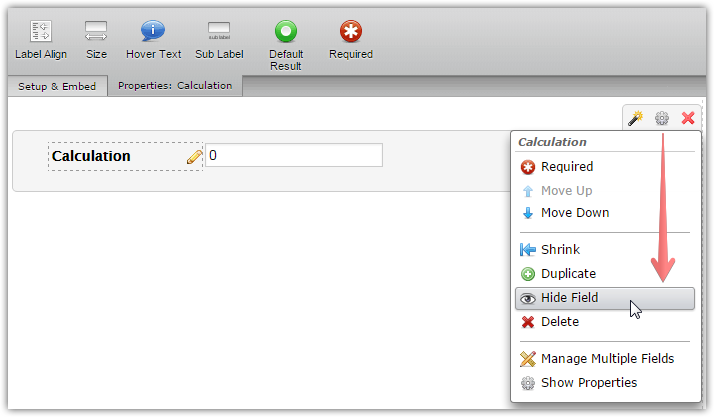 It is possible to hide the calculation fields in the same manner as other fields. Click on the field to select it, click on the gear icon, and then use a 'Hide Field' option. The field will be visible to you on Submissions page, and also available as a Text/Number field on the reports.